The new MiniMed Mio Advance insulin pump infusion set inserter drew eager eyes at the 2018 ATTD conference in Vienna last month. Mio Advance features an all-in-one, fully disposable inserter with a fully hidden needle. To insert a new pump set, users simply peel off the adhesive, remove the disconnect cover, place the set on the desired infusion site, and press the button to insert. There are no parts to put together, no intimidating or visible needle, and the device can be used with one hand – a win for kids, elderly people, and those who wear pump sets on the arm. Created by Unomedical and distributed through Medtronic, the Mio Advance is currently available in the UK, Italy, and the Netherlands, with more countries expected later this year (including Canada). 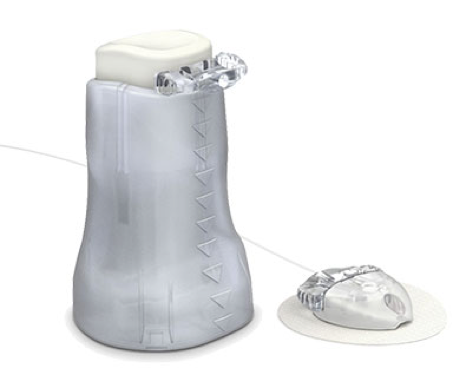 It is compatible with Medtronic pumps and those with a luer-lock connector (Roche, Animas). Mio Advance is limited to use with 6 mm Teflon cannula. It is unclear when the improved inserter will be available in the US, though we’d hope to see it in the list of countries launching later this year. diaTribe Senior Editor Adam Brown and colleagues Brian Levine and Maeve Serino saw the set up close at ATTD and thought it was a very big improvement over current inserter options. In the UK-based launch with a pilot group of 24 users, 92% thought the Mio Advance was better than their current infusion set; 87% were “extremely” or “very” satisfied with the product, and it exceeded expectations for eight out of ten users. It’s excellent to see continued innovation in pump infusion sets, especially options that make insertion easier and less intimidating. On a similar note, we also await the relaunch of BD/Medtronic’s MiniMed Pro-set with FlowSmart technology. The launch was put on hold last February following complaints related to kinking and elevated blood glucose levels. As of this January, BD and Medtronic were finishing a study to collect more evidence on the set.